Jayme over at Holly and Flora doesn’t know that she has a new best friend. She does. One bite of this amazing lemon curd and you, too, will thank Jayme for her recipe. It’s tart, it’s tangy, it’s smooth, it’s luscious. It’s the kind of stuff that you will eat with a spoon (or quite possibly your finger) straight from the jar, standing in front of the refrigerator. Yes, it’s that good. Maybe because it has a cup of butter in it. Butter makes everything better, right? And lemon. You simply can’t go wrong with lemon. I’m thinking that I’ll use some of this as the base for whatever dessert I make for Easter. If there’s any left by then. And I even made a double batch. Because we’ve been invited to brunch tomorrow. Though I’m a little torn as I don’t know if I want to share all of this curd. And now I want to make scones. Lavender scones. On which to smear the curd. Whimper. Oh, and I did go to the tulip fields today. I did not paint (rebel that I am). But I’ve got to cull through all of those pictures before I tell you about it. And there are a lot of them. You know it’s a good day in the tulip fields when you have to use the “jet” setting on the hose attachment to clean the mud of the car and your rubber boots. Back to the curd. So, my curd did not turn out a lovely yellow color. I was a bit disappointed. Then I tasted it and didn’t give a flying leap about the color. It’s truly that good. I think the color is off because the recipe called for cane sugar and I used Sugar in the Raw. Which is brown. I recommend seeking out white cane sugar if you can find it, purely for aesthetics. Wash an assortment of small jars (I used jelly jars that I normally use for canning) in hot, soapy water. Rinse thoroughly. Dry. Wash the lemons well. 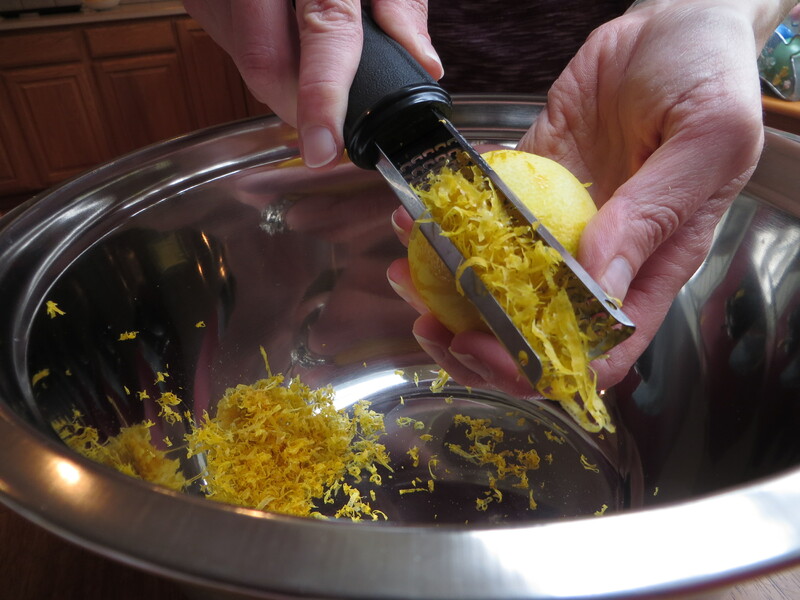 Grate the zest from all of the lemons into a stainless steel bowl. Juice all of the lemons into the same bowl. Bring water to a boil in a separate pot. While waiting for it to boil whisk together the eggs and yolks in a medium-sized glass bowl. Set the stainless steel bowl over the water (double boiler-esque). Add the sugar, salt and butter and stir until the butter is melted. Scoop about 1 cup of the hot liquid out of the steel bowl and pour it slowly into your eggs, whisking briskly (tempering the eggs so that they don’t scramble on you). 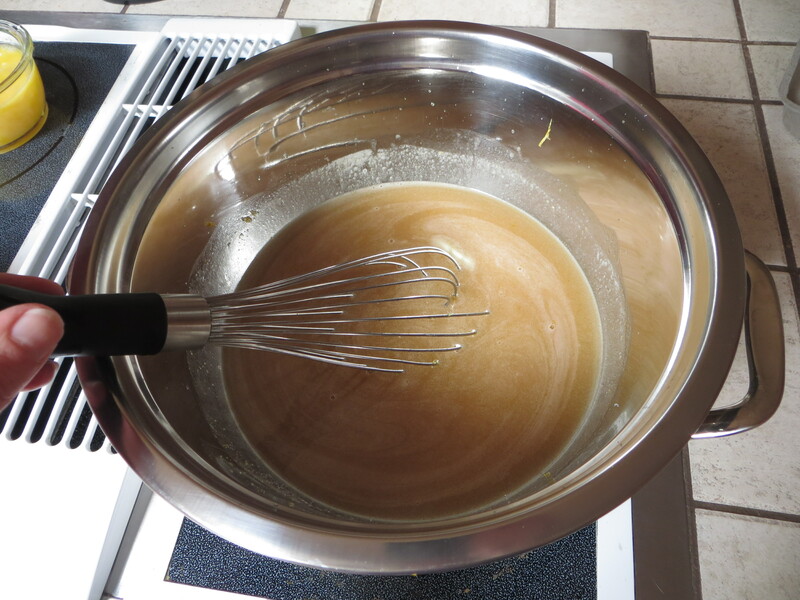 Once combined, slowly pour the egg mixture into the steel bowl, continuing to whisk. 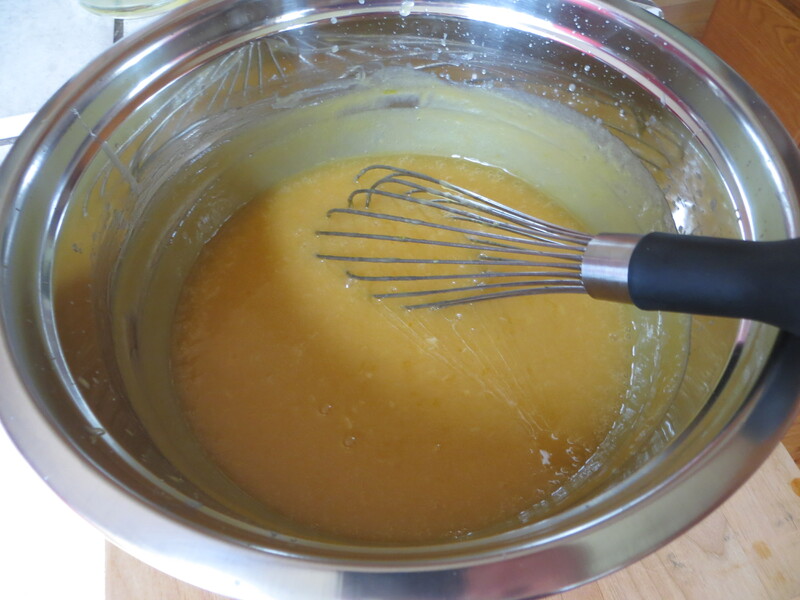 Whisk the mixture constantly for 6-8 minutes until smooth and thickened. Pour the curd into jars and allow to cool. I capped mine with canning lids and rims, just for ease. I filled 5 six-ounce jars about 3/4 of the way full. I, still new to the world of the microplane, found the zesting to be a delightful experience. I would have happily zested a whole box of lemons. Many have fancy juicers. I am a purist. I have a glass juicer that came from my Great Grandmother’s house that I use for all of my juicing needs (this juicer has assisted in the creation of many a pitcher of sangria). 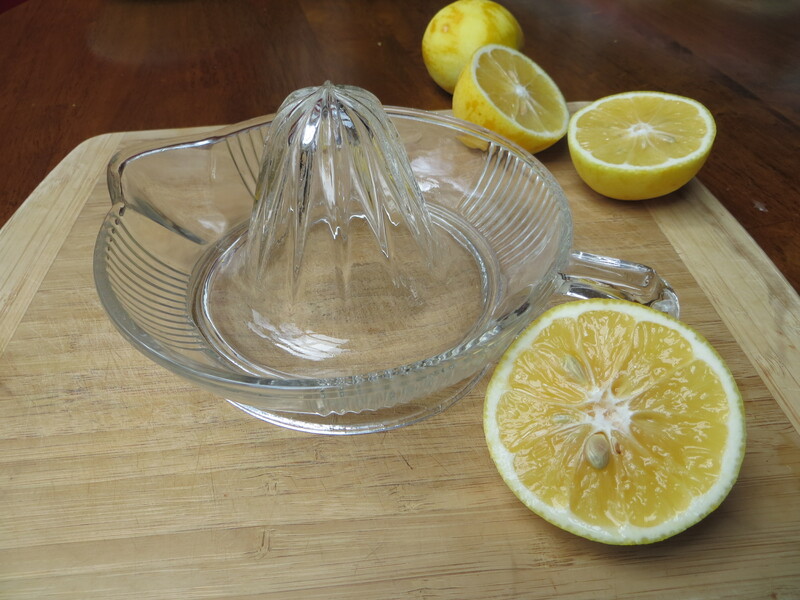 There is something satisfying about using an old-fashioned glass juicer. Chocolate break! 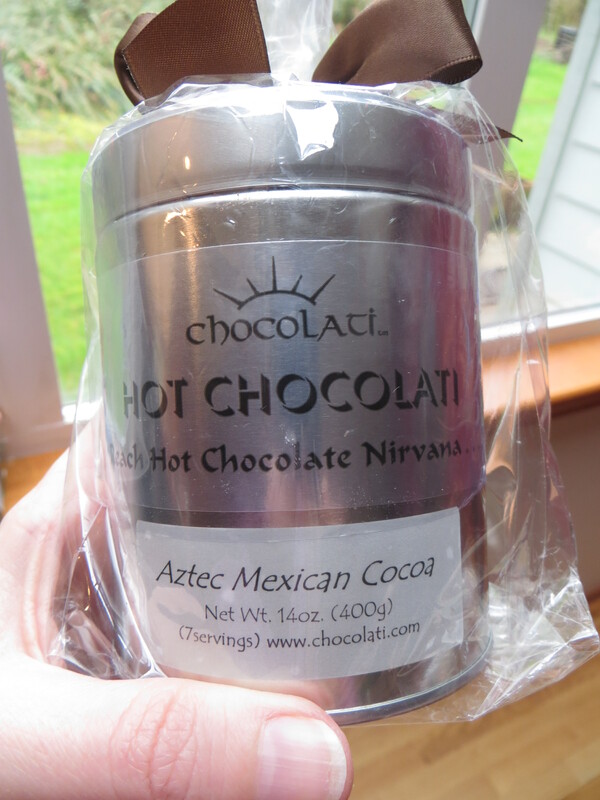 I am a sucker for Mexican Hot Chocolate. I purchased this at a chocolate shop (Chocolati) up in Seattle. It sits across from Greenlake. Ironically, I picked it up after completing the Hot Chocolate 5k. Let’s just say I was in the mood. I tried it this afternoon. 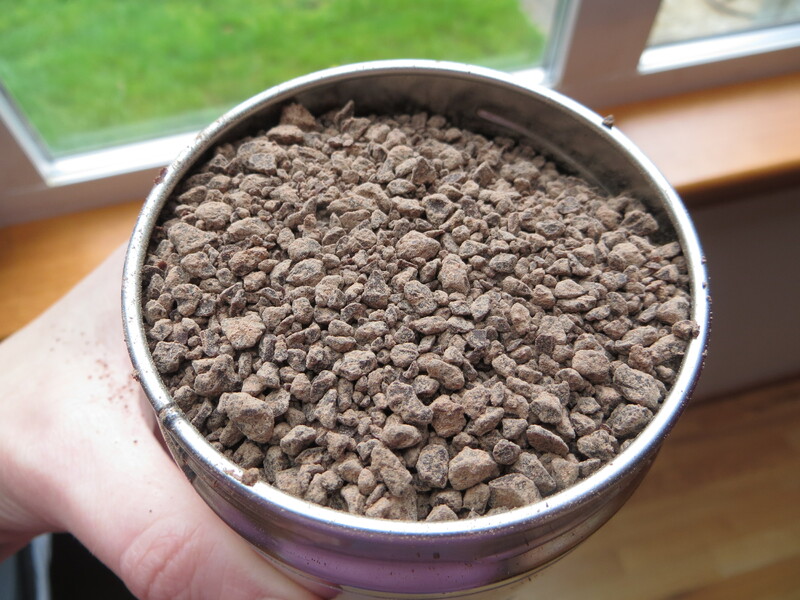 Smooth, rich, chocolate-y, hint of cinnamon. Yum! Plus, I needed something to do while I whisked the curd for 6-8 minutes. I sipped chocolate. What a topping for Home Made Vanilla Ice Cream. Hi, Dad. 🙂 You make the ice cream, I’ll provide the curd. Thanks! And I’m so sorry you can’t enjoy your lemon tree. 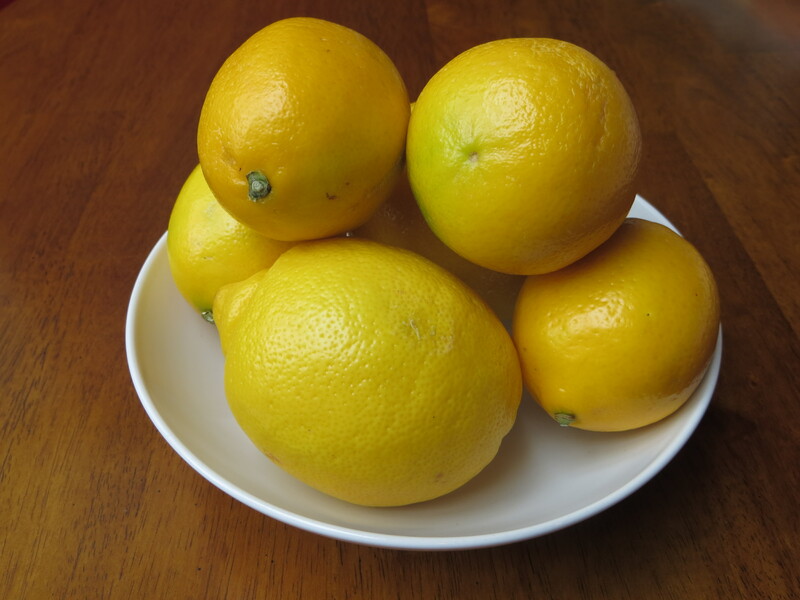 I wish I had a lemon tree, but they don’t fair so well in Western Washington. 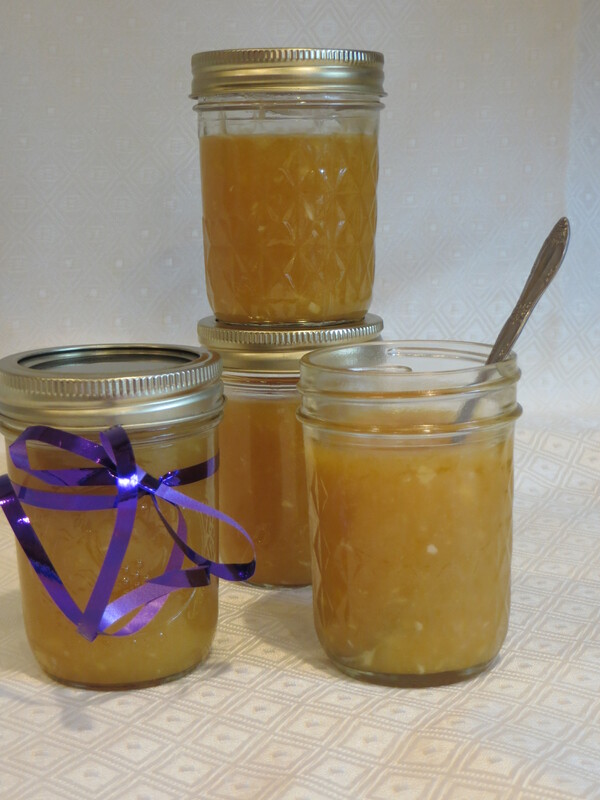 LaNae, I am SO happy that the lemon curd recipe worked beautifully for you. I hope the directions were easy to understand. 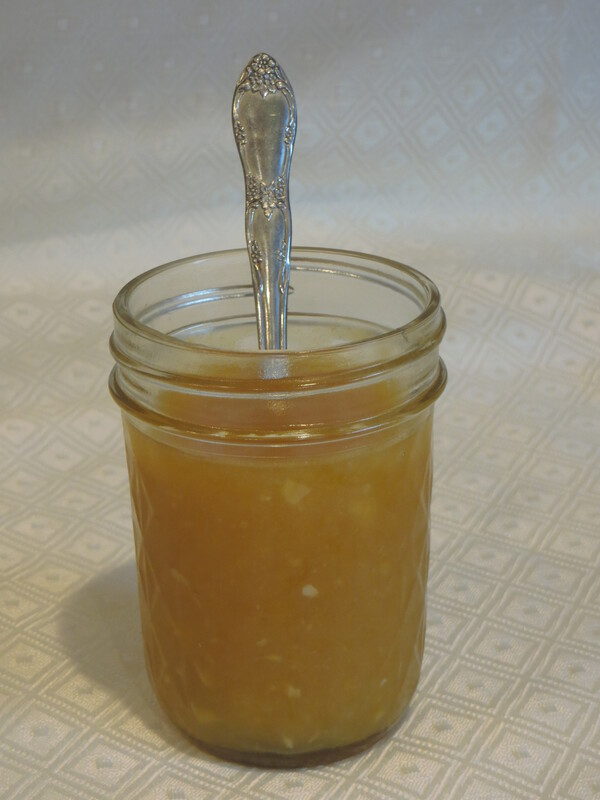 I made a batch of tangerine curd and used raw sugar. It was a golden brown color, but tasted absolutely amazing. We actually have a little stainless steel juicer, and we use it for all of our citrus-juicing needs. I like the extra elbow grease! I love your glass edition. I have not made the lavender scones, but I did make a batch of lavender shortbread dough. Tomorrow evening I’m going to bake a few and slather them with that curd. Dinner may not be necessary. 🙂 I have a large lavender bush next to my front walk, but I’ve always been too busy to harvest it. I’m also not sure if all lavender is edible, and I can’t remember what kind it is.